Give your field workforce all the tools they need to work faster and smarter with the rugged 3.75G HSPA MC67. With the MC67, your workers can do whatever it takes to get the job done. Access information in your backend system. Scan practically any bar code in almost any condition. Capture documents to simplify recordkeeping. Take and send video and photos for real-time repair support. Call a customer with an arrival window. All at 3.75G HSPA speed. So whether your workers are involved in sales, service, deliveries, inspections or issuing citations, they have the tools they need to improve efficiency, accuracy and customer service — all in one rugged device that loves life in the field. 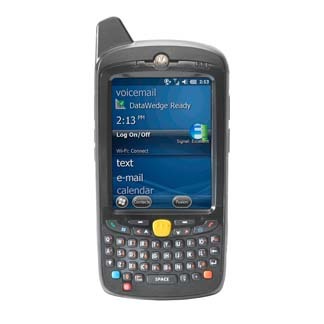 3.75G HSPA , 802.11 a/b/g/n, Bluetooth 2.1 EDR and best-in-class GPS brings your workers the best voice, data and peripheral connections available. Whatever your employees dish out, the MC67 can take it. You can drop it on concrete, drop it in water, use it in the heat, cold, rain, snow and more. A picture is worth a thousand words, so we included a high-resolution auto-focus 8 MP camera with external flash that allows workers to document the condition of deliveries, assets and more in virtually all lighting conditions. With support for RhoMobile applications integrated in the MC67, you can support HTML5 browser-based, OS-agnostic applications — taking time and cost out of application development. With Dual-Microphone Noise Cancellation technology, background noise is greatly reduced — all anyone will ever hear is you. All MC55 and MC65 accessories work with the MC67.